Our Senior High Youth Group goes on two mission trips every year – a spring weekend mission trip and a summer week-long mission trip. Please note that you do NOT have to be a member of First Church to participate in our mission trips! For info about youth trips, contact Trish Walton (TrishWalton65@gmail.com). 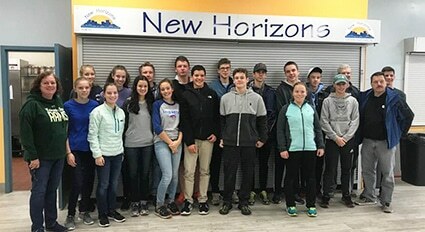 Usually on a weekend in March, the SHYG will travel to Manchester, NH, for a weekend of inner-city service to those who are homeless, hungry, and poor. We volunteer with organizations such as New Horizons and Families in Transition. Usually in late July or early August, the SHYG travels for a week of service with either a home-building agency like Habitat For Humanity, an inner-city agency like YSOP that serves those who are hungry, homeless, and poor, or an agency like Urban Promise that serves the needs of children. Past trips have been to NYC, upstate New York, and Camden, NJ, among others. 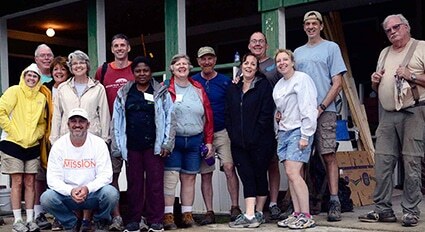 Since Hurricane Katrina in 2005, the Adult Mission Group has made six trips to Back Bay Mission in Biloxi, Mississippi. While the original intent of these Biloxi trips was to help Gulf Coast residents with home repairs following the devastation of Katrina, recent trips to Biloxi have sought to assist Back Bay Mission with housing rehabilitation and repairs for seniors, low income families, and disabled persons.